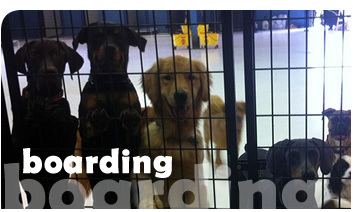 At Lucky Paws, our boarding is daycare-inclusive. Some dogs love to play, some love to sleep, some are social, some keep to themselves. The one thing they all have in common is they want out of their kennel in the morning! Being a dog all day gets exhausting, and most dogs run to their kennel at the end of day for some much needed rest and a good meal, getting ready to do it all over again. So take your business trip or vacation guilt-free, knowing your dog is happy! 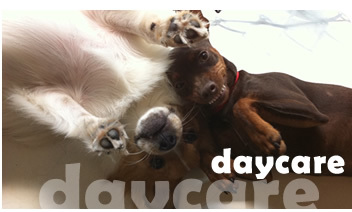 Daycare is more than a luxury, for most dogs it's a much needed escape! With today's hectic schedules it's very difficult to give your dogs the proper exercise he or she needs. Consider many breeds are built to run more than 50 miles a day, 7 days a week. Additionally, your dog will get some much desired social interaction with other dogs. This is critical for having a balanced and satisfied dog at home! Lucky Paws provides a safe, affordable, and convenient supplement to your usual "dog-time" activities. All daycare passes must be used within 45 days. In addition to our boarding and daycare services, Lucky Paws also offers a full service pet grooming studio! Our experienced and talented grooming staff provide a wide range of services from trimming, styling, and deshedding, to medicated oatmeal baths and skin rejuvenation, all while making your dog comfortable and relaxed. We like to think of it more as a dog day spa! You are welcome to schedule a day, or enjoy the convenience of your dog being groomed while they are here for boarding or daycare. We look forward to pampering your pup!